Hello! Karen here, and, yes, that's me pictured, in the garden studio. I hope you are enjoying the website. Here is some more background information about my training in art, in case you are curious. I first took up painting in oils when I was 15 and they have been in my life ever since – I just can't leave them alone. In 2003 I completed an HND in Fine Art at Reading College of Art and Design (now part of Thames Valley University). 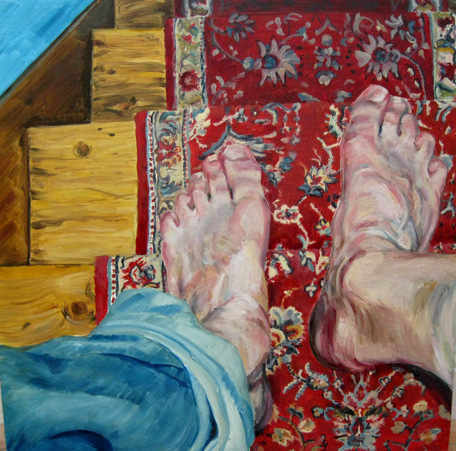 After college, I continued to work in oils; my subjects are mainly still life and landscapes. I take images from life and try to draw the viewer's attention to interesting aspects by sometimes presenting the image from an unusual angle and by the use of colour and brush strokes. I like to see the brush strokes, as I think it strengthens the painting. More recently I have been using the palette knife as well as brushes and I am using thicker layers of paint.